Migrants and asylum-seekers in Morocco often end up living outside in camps with little prospect of continuing their journeys to Europe, returning to their home countries, or becoming part of Moroccan society. Morocco is a place of transit and forced stay for migrants from sub-Saharan Africa. Ceuta and Melilla, two Spanish outposts on the Moroccan mainland, were the scenes of violent clashes in 2005 as migrants attempted to enter European Union territory. At least 15 migrants were killed, dozens more wounded, and hundreds detained. Since then, many migrants have headed to the cities of Rabat and Casablanca, or to areas around Oujda on the Algerian border, where they face extremely poor living conditions and violence. Reinforcement of border controls and other security measures have forced asylum seekers and migrants to embark on longer, more dangerous journeys to Europe with high death tolls. A growing number of migrants and asylum seekers have found themselves blocked in Morocco, unable to continue their journeys, or to return home. They are left with an increasing sense of frustration and hopelessness. Because of their poor living conditions and irregular status, migrants are easy prey for trafficking and smuggling networks. Women and unaccompanied minors are increasingly being subjected to violence and exploitation. Arrests and refoulements across the Algerian and Mauritanian borders by the Moroccan security forces are frequent. Migrants are also at risk of attacks and robbery by common criminals, who act with total impunity. Migrants and asylum seekers come from a number of African countries. Most are from Nigeria; the next largest group of migrants comes from Democratic Republic of Congo and other countries in West Africa. Many have fled poverty and unemployment at home, but a large number are escaping conflict and violence and, in some cases, sexual violence. An MSF aid worker provides a medical consultation during a mobile clinic to a camp where migrants and asylum-seekers are living. MSF began working with sub-Saharan migrants in Morocco in 2000. Since then, MSF has provided medical and humanitarian assistance and advocated for better access to healthcare for migrants and respect for their human dignity. MSF has teams based in Rabat and Oujda. 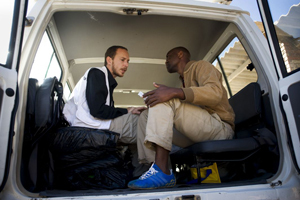 There are two components to MSF’s work: provision of direct curative and preventive medical care; and facilitating access to the Moroccan health system. Sexual and reproductive health is a priority for MSF, and through the program, doctors and nurses provide support and assistance to women and children who have been victims of sexual violence and exploitation. Between 2003 and April 2010, MSF medical staff carried out 28,679 consultations, of which 4,643 were related to lesions and trauma (16.2 percent). Moreover, more than 7,500 people were accompanied and referred to Moroccan health facilities in close collaboration with the country’s Ministry of Health. With MSF’s support, more than 100 patients with infectious diseases, including tuberculosis and HIV/AIDS, were diagnosed and treated in Moroccan health facilities. Migrants now have access to vaccination programs and antenatal care. A man walks through a camp where migrants and asylum-seekers are living in Morocco. Advocacy work to complement these medical activities include lobbying authorities and other actors to assume responsibility for protection and assistance to migrants. 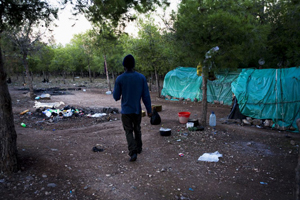 MSF emphasizes the obligation to respect the health and dignity of migrants: in a report published in 2005, MSF documented violence and abuse against migrants inflicted by Moroccan and Spanish security forces. 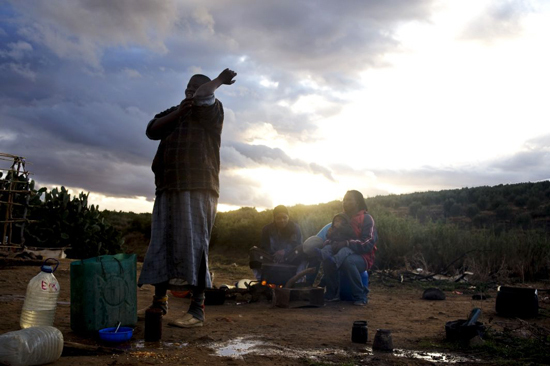 In 2008, MSF presented a follow-up report to authorities in Spain and Morocco. Also, in March 2010, MSF published a report focused on the sexual violence against migrants on their way to Europe, asking to the Moroccan Government and EU countries to address the needs of victims. Increasingly, MSF is adopting a regional approach to provide better assistance to migrants and expand the scope of its activities, planning to open a new project in Mauritania. ‘‘We came on foot. In order to make this journey on foot, you have to be very strong. You only have the water that you carry, and when this water runs out, you have to drink water that you get from camels. There is so much sand, and when you are with small children, it’s hard, it’s really hard. When we arrived in Gadamés we only had a few things to eat; we ate some biscuits. Then some men came to us. They said, ‘We need women’. I asked them why they needed women. They told me again that they needed women and started to beat me. They were so strong. I was raped for five days, that’s five days, one after the other.